A few weeks ago, I was in bed at around 7 a.m. on a Monday morning, awake, and I heard what sounded like something falling off a table in my living room. My first thought was that one of my fish had jumped from the aquarium and had knocked over one of the food containers on the table, and was now flopping around on the floor. I jumped up and ran into the living room and checked the area near the aquarium—no fish on the floor—all fish in the tank and accounted for. So what fell? I looked around, but couldn’t find anything. As I was getting ready to leave for work, I glanced over at where my indoor/outdoor weather station should have been, and it wasn’t there. I looked closer at the table where it normally is, and found it lying on the floor. But how did it get there? It doesn’t vibrate, so it couldn’t have vibrated off the table. It wasn’t close to the edge, so it couldn’t have fallen off the edge due to a strong wind from the nearby window. Maybe there was a minor earthquake. I had no idea how it fell. Nevertheless, I put it back and never gave it a second thought. Now, let me describe the indoor/outdoor weather station because it is central to this story. For many years, I have used an Oregon Scientific weather station for a quick glance of the temperature inside my apartment, temperature outside, barometric pressure and trend of barometric pressure. To gauge the temperature outside, the unit has a thin wire that I hang out of my window. It is a very thin wire that is able to hang out of the window, even if it is closed. At the end of the wire is a small sensor, about the size of a small jelly bean. It is dark gray in color. The following Wednesday morning, I was in my kitchen getting some orange juice, when I heard a very strange sound coming from the living room. I went in there and found a pigeon flapping around on my sofa near the window. After saying a few expletives, I moved towards it, hoping it would get scared of me and high-tail it out of the window. Instead, it moved further away from the window, always keeping me in it’s sights. When I got about six feet away, it decided that I was close enough, and starting to fly around the room, and into the kitchen. I ran into the kitchen after it, only to find it flying right at my head as I entered the room (I ducked). This had never happened to me before, and I had no idea the correct procedure for getting a pigeon out of an apartment. To make matters worse, I had just seen the last half-hour of Alfred Hitchcock’s “The Birds” on Sunday, and was a little scared of the situation—I figured now was the time they were fighting back. After chasing the pigeon around the apartment, and ducking from it half the time, I thought of a brilliant plan. 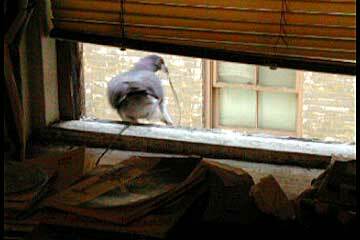 If I could make it to the linen closet, I could grab a bed sheet and possibly entangle the pigeon in it. It was worth a shot. In a scene reminiscent of a Hollywood movie (think Jodie Foster in Panic Room), I made a dash for the linen closet while trying to avoid the intruder. Being that the closet was about 10 feet away from where I was standing, it was an easy dash. I grabbed a sheet, opened it up, held one end over my head, and was able to corner the intruder enough to toss it on top of the fowl while it stood on my sofa. I was able to then gather the corners of the sheet together and create a sort of “hobo” basket with the pigeon in it. I quickly took my prize over to the window, and made sure that I had a firm grip on two corners. The pigeon was thrashing about the whole time. I then threw the sheet out of the window, so that the two far corners would fall and open the whole sheet. The pigeon tumbled out, flapped it’s wings, and flew away. I had hoped it would be the last time I had seen it. I then sat on my sofa to collect myself. Feathers were everywhere. The thing that bugged me as I sat there was why it had come in through the window in the first place. 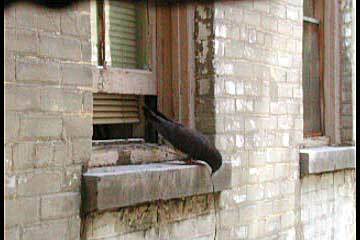 I rarely see a pigeon on my windowsills. Even though the window is open about six to eight inches, the blinds are lowered almost all the way down, with only a two inch opening between the windowsill and the bottom of the blinds. About two days later, I was sitting in my living room, and I heard a sound from the window. When I looked over, I saw a pigeon moving around wildly. It could best be described as “thrashing”. It had something in it’s mouth. As I continued to watch, I could see that the thing in it’s mouth was the wire from my desktop weather station. It looked like it was fighting with it. Ah ha! I figured out what it was doing! It was as if one of the cosmic tumblers fell into place, and one small part of the universe revealed itself to me. The pigeon found the wire from the desktop weather station to be irresistible. It must have thought it was a very long worm, or some great building material for it’s nest. It was trying to commandeer the wire, and it wasn’t going to take “No” for an answer. That must have been why the weather station fell off the table that day! That must have been why a pigeon found it’s way into my domicile! 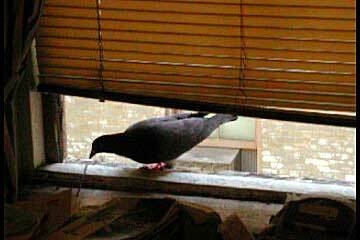 I lunged toward the window, and scared the pigeon away. Realizing that it was time to get ready for work, I pulled the wire all the way into my apartment, just in case the scavenging visitor decided to come back. When I got home that evening, I put the wire back out the window and moved several computer related manuals and parts onto the top of the radiator cover beneath the window. This was to “build up” the area right in front of the window so that a pigeon would not want to come in again. I placed one pile on top of the wire, just in case the pigeon tried to grab the wire again. As of the writing of this page, I have seen at least two different pigeons, on several occasions, try to grab the wire. During one such ten minute session, I was able to capture some video of a pigeon from both the inside of my living room, and from my kitchen window (which has a view of the outside of the living room window—apartment is shaped like an “L”).